Takahashi FSQ-106ED @ f/5.0 (530 mm F.L.) Captured at 3.5 arcsec/pixel. Shown resampled to 11.2 arcsec/pixel. HaGB + RGB to further enhance the Flame and blue reflection nebulae. A second RGB overlay was used to bring more color to the stars. CCDSoft, CCDStack, Photoshop CS w/ the Fits Liberator plugin and Noel Carboni's actions. CCDStack to calibrate, register, normalize, data reject & combine sub exposures. PhotoShop for non-linear stretching and color combine. The Horsehead Nebula is one of the most famous nebulae, about 1500 light years away, in the constellation of Orion. Although difficult to see, even with a large back yard telescope, the nebula is truly spectacular when imaged with a CCD camera. The horse head feature is actually a dark nebula, of opaque dust, also cataloged as Bernard 33 or B33. 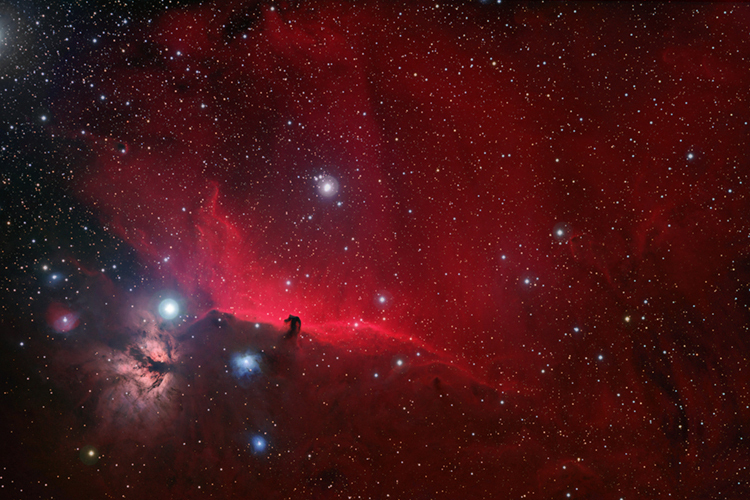 The horse head is actually located in front of IC 434, the background hydrogen cloud. This emission nebula's red color is caused by electrons recombining with protons to form hydrogen atoms. The bright area, at the lower left, is the Flame Nebula. Also visible are some blue reflection nebulae.